Harry (aka Skip) Masters of 136 Huron St., Embro was the son of Wesley and Ruby Masters. He was born in Embro, Ontario. 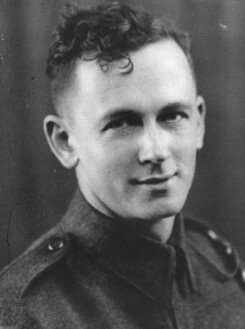 He enlisted in the Canadian Army in 1941 and served with the 4th Canadian Armoured Brigade. Home on leave, he married Maisie Dorward on January 1, 1942. Together they raised a daughter Carol and son John. Following the war he became a manager at Brewers Retail for over 30 years, was an active member of Ingersoll Golf and Country Club, King Hiriam Lodge #37 A.F. & A.M., Ingersoll, Royal Canadian Legion Branch 119 Ingersoll and an Honorary member of the Woodstock Navy Club. Harry passed away on July 23, 2011 at the age of 91.